First produced as an art contest entry by Polish graphic designer Piotr Mlodozeniec, the quirky bumper stickers have only continually increased in popularity since the late 90's. The design typically seen today is not the original version of the artwork (the original can be seen here). The first 'Coexist' artwork contained only 3 letters being replaced by symbols; a crescent moon for the 'C', a Jewish star for the 'x', and a Christian cross for the final 't'. The more recent and certainly most popular version exhibits all letters in the word replaced by an eclectic mix of religious symbols, from an Islamic crescent to the equally well-known Taoist yin-yang. This now-infamous version of the aptly-named 'one-word poem' was first created by artist Jerry Jasper. First manufactured out of a closet in 1993, Jasper added features to the previously-known design including the male/female symbols for the 'e' and Taoist yin-yang for the 's' to create the 'Coexist' design known today. It wasn't until a call from Ralph Bronner (son of the famous Dr. Bronner's Organics) requesting the sticker designs for resale did Jasper realize he had 'made it'. 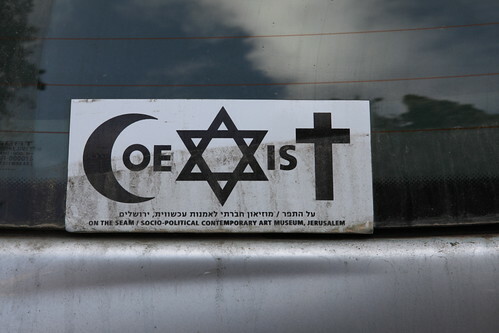 Because of the explosion in popularity, Coexist stickers now come in a variety of colors, sizes, and background designs. The origin of these variations still bloom from Jasper's design. Demand for the 'Coexist' ideal also forced Jasper into other 'one word poem' designs such as 'Respect' and 'Unity'. Furthermore, the current Coexist design can now also be found on much more than stickers. EcoSmart Designs offers the current unmistakeable Coexist design as a multitude of beveled pewter jewelry made in the USA. If it's the iconic sticker you're after, you are in luck! Each and every Coexist pewter pendant purchased comes with a complimentary 1” x 3” classic sticker. The importance of the message conveyed by these stickers has never been more prevalent, or profound. Worldwide, subtle differences in culture, personality, environment, and religion constantly create divides between people of all backgrounds and nationalities. In the end, though, we are all one species and therefore must act in symbiosis. If the presence of these seemingly small symbols for global understanding between all types of peoples can change a person's perspective even for a moment, then it is worth the emergence.